How do I use a neti pot? It’s very simple. I fill the pot—which resembles a small tea pot or Aladdin’s lamp—with warm saline (salt) solution. Leaning over a sink, I place the spout in one nostril and allow the rinse to gently pass out the opposite nostril. I repeat on the other side. The warm water is so soothing, and I can breathe much more easily afterwards. 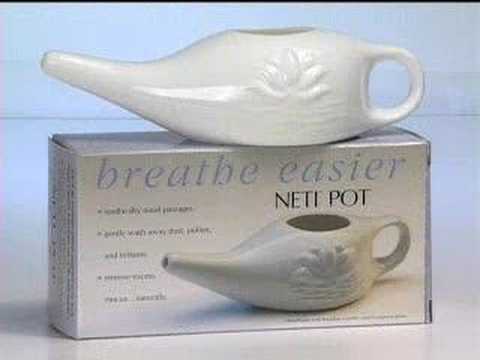 Watch this YouTube video to see how fast and easy using a neti pot is. The second half of the video demonstrates some exercises to help clear your sinuses of any leftover water, but I’ve never had to do this. Note: most sources now recommend using distilled water or previously boiled water rather than tap water. The saline solution hydrates and loosens the mucus in your nose. Some mucus is good—it grabs on to dust and pollen and viruses and moves them out of your sinuses. Winter air and the use of cold and allergy medications, however, can dry out the delicate tissue in your nose. You might notice that your nose bleeds more easily in cold weather. If the mucus is too thick and dry, the tiny little hairs (cilia) that move the mucus stop working. The neti pot has its roots in eastern medicine. In western medicine, saline nasal irrigation (SNI) has most commonly been used following sinus surgery. But in 2009, the American Family Physician journal published an article recommending wider use of SNI as a safe and effective treatment for minor sinus problems related to colds and allergies. As always, I prefer a preventive approach. So how does the neti pot help prevent a cold? Simple. Consistent use of the neti pot, once or twice a week, keeps your sinuses hydrated and healthy, and healthy sinuses are much more resistant to infection. I began using my neti pot 10 years ago, and have only had three or four colds since. Before, I would suffer three or four colds every year. Americans annually spend billions on over-the-counter (OTC) and prescription medications to treat sinus symptoms. Neti pots are available in most drugstores for about $10-15. You can buy pre-measured packets of the solution, or easily make your own. I make one cup at a time, and it lasts for months. In a small container, blend 1 cup non-iodized salt with 1 teaspoon baking soda. To use, mix 1/4 teaspoon with 1 cup warm water. Stir well. Use half of the solution for each nostril. I love my amazing neti pot and consider it one of the best (and cheapest) health care investments I’ve ever made. You might, too.